Card discard is always useful and always annoying. This card is powerful but situational. You’ll note that it only forces discards of revealed cards. What is a revealed card? It’s one your enemy can see. The use of revealed cards is a good example of something we do in a computer game that would be fiddly in a real card game. In the computer game, you hold your revealed cards with your other cards and both you and your opponent see them as if they were face up. In a real card game you’d have to put them on the table or something so that you could both see them. So, how do cards get revealed to your opponent? Well, there are obviously cards that do that. Also, the computer will track of whenever you would know what a card is and count it as revealed. 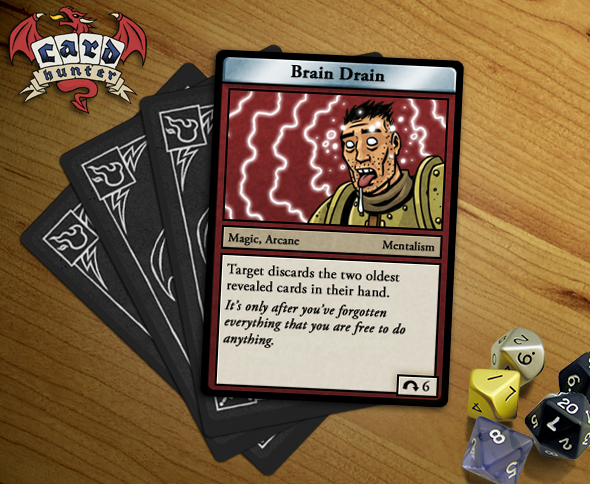 For example, if you play a card and then immediately pick it up and put it back in your hand for some reason (as a result of special rule text on the card), that card will now be revealed to your opponent. Those reasons alone wouldn’t be enough to make the number of revealed cards very high and Brain Drain would be pretty useless if those were the only factors in play. But there’s another game system that causes cards to get revealed and we’ll get to discussing that very shortly. In the meantime, try to keep your thoughts to yourself. I’d keep my thoughts to myself, but I’ve already revealed them. Interesting that once a card is revealed you can see it in their hand. I like that aspect, it helps remind me that i know which card is in their hands in case i forgot.